Last night I dusted, waxed, polished and finally donned my soloing shoes, and headed into Black Temple. Unfortunately I had to ‘announce’ my intentions as when I got there I realised… no raid partner. I meekly asked Shigeko if I could form a raid and he agreed, then noticed where I was. After a small amount of “what are you up to?” I acquired my raid friend and headed in alone. When I was here at 80 the trash was impossible, so I was not hopeful of much success. But to my pleasant surprise, it was perfectly soloable at 85. The patrols of two small water elementals were obviously easy – but only worth 2 or 3 rep each. I ignore the first two large groups just inside the entrance and headed up towards Najentus. The larger patrols of two casters and an elemental were fine. I concentrated my single target attacks on the elemental and off-swiped-mauled-thrashed the group down, no issue. The larger packs up the ramp of melee mobs and hydra were also fine. I continued clearing up to Najentus, each of the elites are worth 16 or so rep, up to 25 rep for the large elementals just before Najentus himself, so it was a good farming exercise. 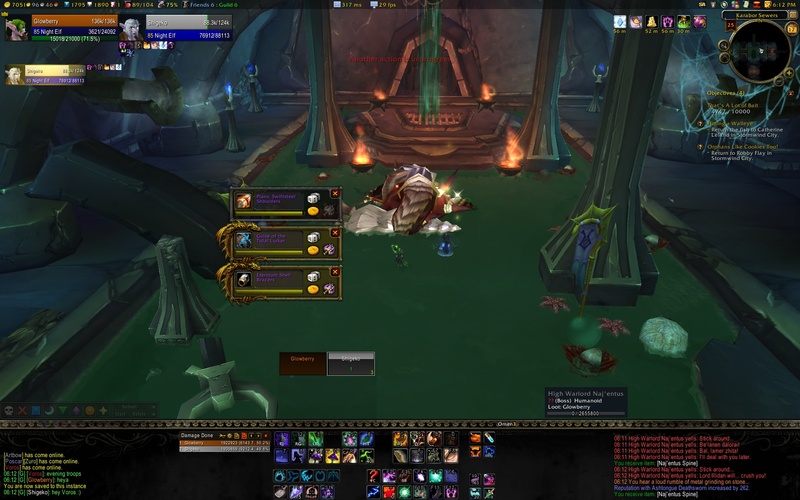 I’ve read that Najentus isn’t soloable due to his spine attack, so when Shigeko noticed where I’d cleared to he offered to come see if we could duo him. On the way there he read up and saw that he’d been duoed by a holy priest and moonkin, so we decided he’d be a breeze. I headed back to the instance entrance and decided to clear those large groups while waiting for Shigeko. This is where I learned something interesting. I Hibernated the turtle and shifted to bear, but wasn’t really paying attention and suddenly found myself being hammered. I started popping cooldowns but all too little too late. The last mob alive was on 10% when I perished. So I released and zoned back in – and the entire pack had respawned. So, I learned by dying (sacrificing myself for knowledge, how noble! 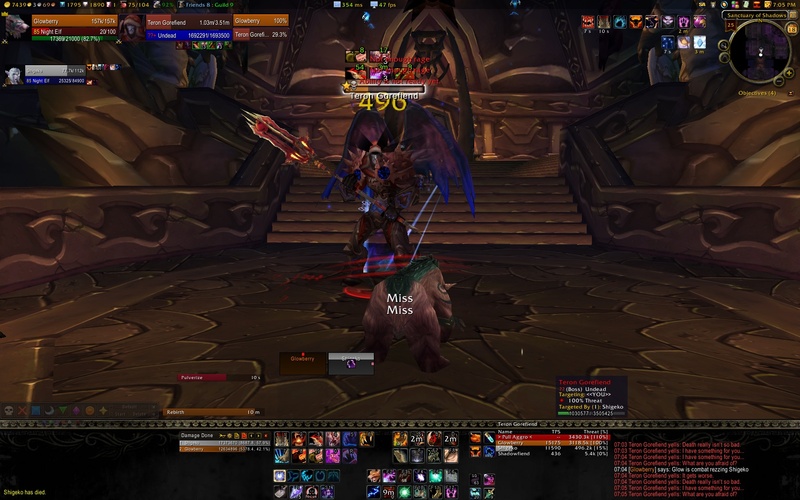 *cough*) that I can kill all but one mob in that pack and zone out, zone back in and the whole pack is back. Basically I can farm the rest of my Ashtongue rep on that one pack, woohoo! Will come back next week after reset and do that. Shigeko arrived and we headed up to Najentus. Decided as usual to just ‘see how things went’ with me tanking and he dpsing. The tank damage is so minimal I self healed and VE’d through it all. We stood together, and I removed the spine each time Shigeko was impaled and burst Naj’s bubble when he shielded. Apart from that it was simple tank and spank. He dropped druid loot (of course!) and 250g. Emboldened by our success, we headed up to Supremus. Another long rep clear trash clear and Supremus was a pretty simple tank and spank – except I forgot he drops aggro after the kite phase and almost didn’t save Shigeko. Oops! Didn’t get a screenshot, but he was pretty dull and easy. I imagine he’d be a simple solo fight. 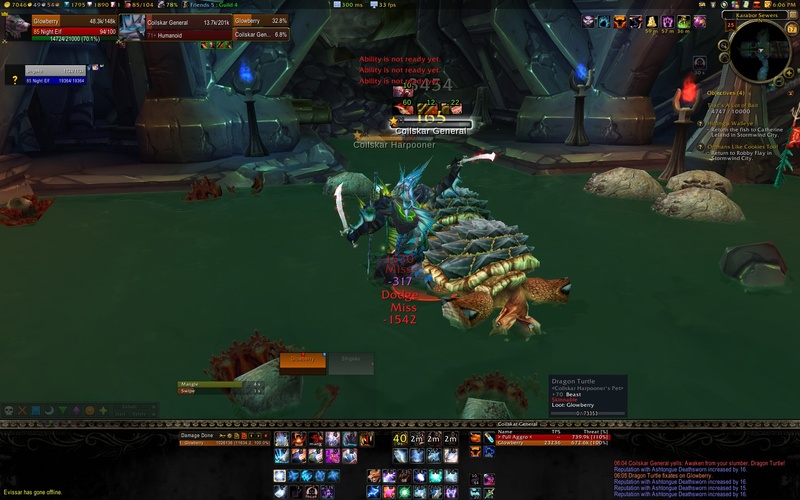 Then another very long trash clear and we headed to Teron. We really weren’t sure how this would go. We hadn’t had the *pleasure* of the ghost phase for years, so we were pretty sure that we’d just have wing it. Basically I tanked and Shigeko dpsed hard until he was chosen to die, and then he managed the ghosts. They were attacking me, but the amount of damage was pretty negligible. Once the ghost phase was over, I flipped out and brezzed Shigeko, and we duly rinsed and repeated once more. For the last 10% or so once Shigeko had died again, I had to solo him down. With my poor bear dps it was pretty slow. But he obligingly let me erode him away, and we had another 250g and some awesome caster robes for Shigeko’s wardrobe, so we headed down to Gurtog. This is where the happy story ended. Gurtog’s bleed stack lasts 2 minutes and stacks fast, so it really does require multiple tanks for it to drop. After 3 or 4 attempts trying various combinations of agro swapping and me in healing/tank spec/gear we decided to call it. Plus dinner was ready and we were hungry. So I’m still thinking about this guy and ways to solo/duo him; any ideas for Gurtog folks?